AnonD-64776, 26 Mar 2013Iphone is much better in term of functionality, simplicity, OS reliability, and design stylish... moreWow....Now try to make a truthful logical statement. Hay guys when is S4 reaching southafrica? And what is especting price? i wish Samsung will colaborate with Carl Zeiss. Fair point. BUT, Apple has key elements that are consistent in every iPhone, and have not changed. The home button has never changed in size, design or shape. Volume, power and mute buttons are consistently used. Looking at iPhone from the front only, at a first glance you'd have a hard time telling the generations apart. That's what makes a high-end brand what it is. You'll always recognise a BMW, no matter what generation, same for iPhone. Iphone is much better in term of functionality, simplicity, OS reliability, and design stylish. Where is the practicability if you need to operate the phone with your two hands. If u need bigger screen go with tablet. You're not buying a toy thta has gimmicks like smart stay etc which in the end you'll never use it. A handphone will be with you all the time but wiill u carry a cheap plastic toy? AnonD-128657, 24 Mar 2013Right now the biggest dealbreaker here (for me) is the non-LTE variant which has the better c... moreI was thinking the same. Until I realised the octa core only still used quad core so either the 1.6ghz at maximum cpu draw. And in stand by it will switch over to 1.2ghz. So you will essentially gain minor battery gains. I'd still prefer the LTE using 1.9ghz quad core all the time. For better performance. Rather than battery life... Snapdragon make some good stuff. I'm uncertain about the support the rom community will give the Exynos. AnonD-92559, 26 Mar 2013I'm not an iphone fan boy but still what you are saying is wrong.Go Check out in youtube s3 v... moreAre you sure?? I'm looking at the mobile review site. Look @ the starhucks sign of S4 comparing to iPhone 5. The logo showing for iPhone 5 is so washed out with the green color! Words are also not sharp for the iPhone 5 photos. Even S3 has a better green than the poor iPhone 5. Then look at the coins photos. iPhone 5 ones are too over exposed. And look at the man face for iPhone 5. So orange in color??! S4 is much better in almost every photos imo. Why do people have a problem wirh touchwis. HTC, Samsung and LG - if it wasn't for the fact that it's written on the phone - a lot harder to differentiate. OMG! An entire 0.7mm slimmer, 0.8mm narrower and a whooping 3 grams (!) lighter. I mean, MARVELOUS, right?! AnonD-116273, 21 Mar 2013samsung vs htc : - htc better than samsung in phone ui - htc better than samsung in phone ... moreYou sound like a mad man..
Also, get your facts straight, half the things you're spouting are false. Have you even checked the benchmarks? Or the fact that the S4 and HTC One has the same CPU for many countries, but S4 at a higher clock speed? 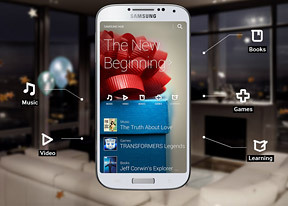 I am disappointed that the Samsung Galaxy S 4 does not have a radio unlike its predecessor, the Samsung Galaxy S 3. What a let down! AnonD-128657, 24 Mar 2013Right now the biggest dealbreaker here (for me) is the non-LTE variant which has the better c... moreLike me, you'd probably do better to wait for a better review on specifications. Especilially a speed test between the two different chip sets.